In 1906 a sudden and unexpected event occurred: the Great San Francisco Earthquake. The city was severely damaged by the magnitude eight earthquake along the San Andreas Fault, felt as far away as Oregon. Even more destructive was the resulting fire caused by broken gas pipelines which exploded, burning nearly all the remaining city. If that wasn’t enough, all the waterlines had also been broken by the earthquake, and it was only by blasting some of the remaining houses that the fire was brought under control by the resulting firebreak. The study of earthquakes was hardly advanced at that time, and many new and undiscovered principles and effects of earthquakes have since been discovered by those investigating the causes of the San Francisco earthquake and destruction. Indeed, the predecessor of the now popular plate tectonics theory was spawned by this event. Fences around the San Francisco area had been broken in two by the earthquake. The pieces had been moved around in such a way that the boundaries of property in the area were difficult to discern. Attempts at surveying the damage led H. F. Reid, a scientist of the time, to propose that the earth’s crust was stretching like a rubber band, and that earthquakes were caused when the stretching became “stuck,” and then finally broke free. The trouble was, he couldn’t explain what would cause the stretching to stick. After continuing the survey of California, scientists produced so much evidence of movement, that the now common plate tectonics theory was proposed. Plate tectonics explains that earthquakes can occur as the earth’s plates are moving. When one jagged edge of a plate snags on another, both plates stop moving. This causes pressure to build up until the plates break free. Result? Built up force is released at once, making the ground move. This theory underlies the world’s understanding of earthquakes today. Another interesting effect of earthquakes that was noticed during the San Francisco earthquake was liquefaction. In liquefaction, wet sandy ground, which is ordinarily a good foundation for buildings, is shaken and the water in it is, in effect, squeezed out due to the pressure waves of the earthquake. The sand then turns into a muddy liquid and flows, causing buildings to sink into it and collapse, and as was the case in the 1906 earthquake, the flow snaps waterlines needed to fight fires. So much for good sandy foundations. The large 1906 earthquake contributed greatly to science by helping unveil the chief scientific explanation of why the ground moves. San Francisco was rebuilt on a much larger scale than ever before with more earthquake-resistant buildings. New building codes were enacted, such as cross bracing in walls, and setting buildings on shock absorbing foundations. In short, the Great San Francisco earthquake of 1906 contributed the concept of plate tectonics to earthquake science and has left San Francisco in readiness for the next big quake. This grainy video is among the earliest known footage of the disaster. Background information from the U.S. Geological Survey (USGS). Use the sidebar on the left to navigate. A chronology from the Museum of the City of San Francisco. Eyewitness account from the son of a battalion chief in the San Francisco Fire Department. Newspaper front page from the Library of Congress. Award-winning 46-minute video from the USGS with historical footage and interviews. The most comprehensive investigation, known as the Lawson Report. Probably too comprehensive for most, but interesting nevertheless. Simple earthquake science covering the different types of faults and how they are measured. From USGS. Basic facts from the USGS. 18-page download from USGS.gov for young people. Animation of an earthquake as it travels. From PBS. They are occurring more often that you might think! What is more fun than edible experiments? Candy Quakes for the older student. An interactive calculator that compares earthquake magnitudes. Some homeschoolers like (and some greatly dislike) the books in this series published by Scholastic. The choice, as always, is up to you! 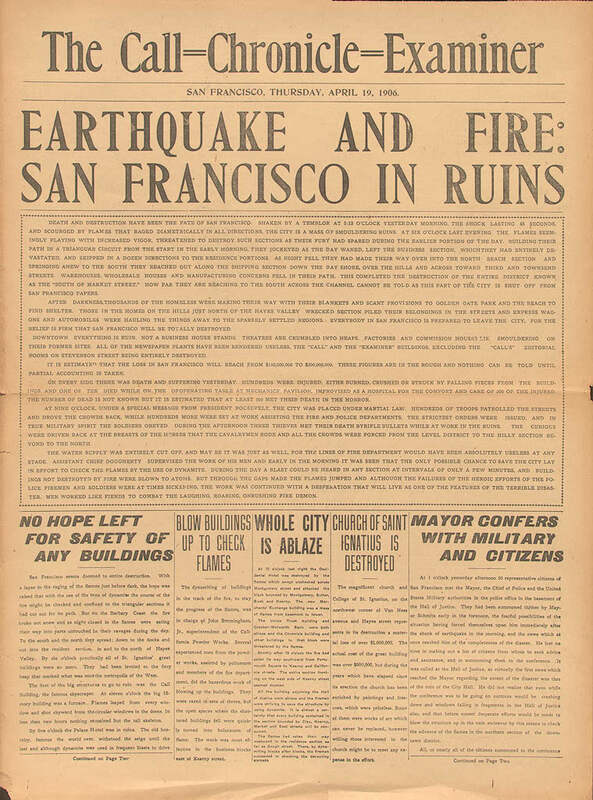 Very informative, 36-page, 100 anniversary publication detailing 1906 earthquake at USGS.gov. This book now in the public domain is largely a compilation of eyewitness accounts. Heavily illustrated public domain book from the U.S. Geological Survey that explains what they are, where they occur, how they happen, how they are measured, and examines earthquakes through history. Great resource! 74-page download from FEMA featuring a series of activities. Large 259-page download from FEMA with lesson plans and activities. Printable infographic at Weather Underground. Free set of experiment pages from NotebookingNook.com. Simple pages for wrapping up and narrations.